Roofing & Solar Installation in Lafayette, CA “Green Air” Concord, CA from Green Air on Vimeo. New Roof & Solar: Real Clients’ Testimonial from Green Air on Vimeo. Solar: A Real Client’s Testimonial www.GoGreenAir.net from Green Air on Vimeo. Solar & Roofing: A Real Life Client’s Testimonial from Green Air on Vimeo. 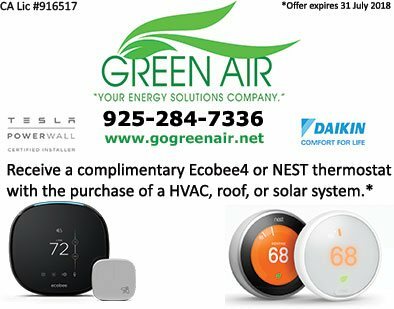 by Brett Barnes on Green Air Heating and Air Conditioning, Inc.
Nick Donzelli and Green Air have taken great care of me and my home. The knowledge and ability to tailor specific systems to your home is above all other similar companies I have seen in this industry. Great service, great follow through. by Michael Melvin on Green Air Heating and Air Conditioning, Inc.
Our solar was installed on our house earlier this year. I found Nick and Green Air to be extremely professional, responsive to questions, and started and completed the job on time. Nick has a very strong work ethic, and was competitive in his pricing as compared to other companies. It's also nice to know that PG & E is now my customer! by Tobi Melvin on Green Air Heating and Air Conditioning, Inc.
Nick and Green Air installed our Solar One year ago, it has exceeded its projected output and works great! The work was started and completed on time and Green Air completed all the extra work such as getting permits from the city of Benicia. Green Air employees cleaned up their work site daily and they were a pleasure to work with. I love the fact that we have shrunk our carbon footprint. by Mike Nooraei on Green Air Heating and Air Conditioning, Inc.
Nick is very well educated on the products industry. He has been in the industry for years now and knows more than anyone else I have spoken to. Its very refreshing to have the owner of the company come out to talk to you about your options compared to a door to door sales guy who cant even answer the most basic questions. Im very happy with the service and attention to detail. Thank you! by Anonymous on Green Air Heating and Air Conditioning, Inc.
My husband and I recently bought a house in the area of Los Angeles. My new house needed multiple repairs and I also wanted to install solar panels to save more money on the long way. When I contacted Green Air Solutions I explained to them what I needed for my new home and what my budget was. I wanted to get a new roof with solar panel installation, a new HVAC system, insulation, turf in the front and back yard, paving in the back yard and new eco-friendly windows. They came to my house and after they did an inspection they provided me a free estimate of the cost for the whole project. It was over my budget but they offered me financing help through a program called Hero. I looked for other contractors but the prices were to high or they didn't provide any financing assistance. After I hire Green Air Solutions to pretty much re-build my home it took them around three weeks to finish the whole project. They were very professional and they also give me a guaranty on all the products and services that they provided me. My home looks really nice on the outside and my HVAC unit will definitely keep me really cool this summer. Will definitely be using their services again for the future. Thank you! Thank you! Thank you! Responded quickly with excellent service and competitive pricing. by Mike N. Pleasant Hill, CA on Green Air Heating and Air Conditioning, Inc.
by Tammy S. Alamo, CA on Green Air Heating and Air Conditioning, Inc.
by Nolan Y. San Francisco, CA on Green Air Heating and Air Conditioning, Inc.
by Matt W. Concord, CA on Green Air Heating and Air Conditioning, Inc.